Tingling is the body whole standing in front of you. In front of one who’s received so much of my trust and loving. Mouth wide open, yet words unable. In my head, speaking an entire fable. Tears paint the canvas blank that you see. Letting emotions explain this art to thee. Eyes we have shared, touch we have not. To understand we are trying, our plot. My daughter, your son, through me flowing. Heart delicately tickled with thoughts of that being. Your loved friend, my bicycle idol. Too late for this pill only gained by referral. Embraced you had would have been in my dreams. Love that heart of me carries, flourishing like river from streams. A taste of my care you chose to consume. Successful were you at removing my costume. Thanks says I to you my true love wanted so sincerely. Lighted the match to the candle, giving life to rooms of obscurity. During his first term in office, Our Mayor crowned himself with the gilded dome atop a grandly refurbished City Hall. During his second term, he is attempting to wrap a redesigned UN Plaza around him, like an ermine cloak of empire. Not content with remaking the city in his own image, Willie Brown is taking on the whole world, in the form of the United Nations. And if we’re not careful, it will be his face, and not the great round seal of the UN, that will define the space leading from mid-Market to the Civic Center. In response to a request by Supervisor Chris Daly, the Department of Public Works recently compiled an eight-inch-high stack of documents pertaining to the site. From these, Brown’s pivotal role in DPW’s renovation plans becomes clear. It is a role that goes far beyond the removal of a few benches. 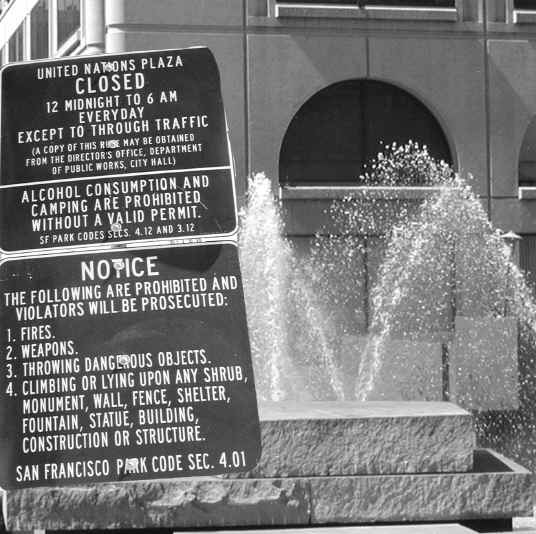 UN Plaza came into being in the mid-1970s as part of a mid-Market redevelopment project extending all the way from the Embarcadero to the Civic Center. To create a public conduit into the official center of San Francisco politics and culture, architects Lawrence Halprin, Mario Ciampi, and Carl Warnecke laid out a brick-paved space covering 2.6 acres and lined with rows of plane trees. But the space also reminds visitors of San Francisco’s position as host to the conference that gave birth to the United Nations. It’s rich in international symbolism, with the UN seal engraved in granite and placed at the center of the plaza. Most impressive, once upon a time, was the fountain, composed of more than a hundred granite blocks, arranged in five clusters to suggest the five major continents. Every two minutes, jets of water shot into the air, alerting passersby that the fountain was about to fill — and then drain — in a re-creation of the ocean’s tidal movement. More mundanely and more practically, the city pumped off the water to wash down the plaza and nearby streets. But the years took their toll, and the fountain fell into disuse. Nevertheless, a Site Assessment Report prepared by a DPW landscape architect in September 1999 found that the plaza was generally doing the jobs it was intended for: it established a visual identity for the area; offered “a lively, entertaining destination place” for residents and visitors; expanded the city’s opportunities for open space; provided a clean, safe, and reassuring environment; and made use of an existing transportation system. If there was a problem, the report suggested, it was that the United Nations elements had lost some of their earlier significance. That was a problem easily remedied: fix the fountain, and connect it visually to the north entrance at Leavenworth with welcoming signs and banners. Oh yes, and if you’re feeling really ambitious, move the out-of-scale statue of Simon Bolivar to another location. The obvious explanation is that somebody doesn’t want seedy street people cluttering up the area. The media made much of the removal of the benches on April 28. The proposed replacements will certainly discourage loitering by undesirables, although the city disability access coordinator points out that they will also discourage people in wheelchairs. But maybe they’re undesirable, too. The removal of the fountain will discourage loiterers as well. It will also remove what is now the meeting point for three streams of foot traffic, or rather, it will reduce three to two. Today, the fountain forms a nexus for the official, the commercial, and the residential city. Tomorrow, a direct line will lead from Market to the Civic Center, without the scruffy entrance from the Tenderloin. 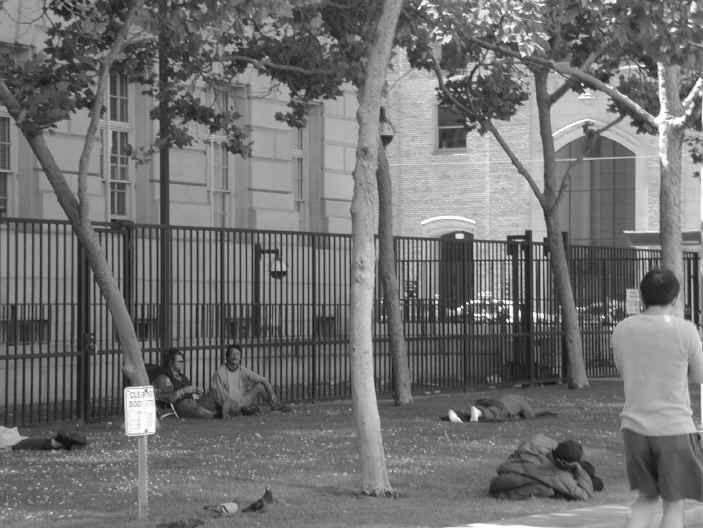 Today the lawn near the north entrance is used as a place for conversation and repose. That’s where the playground will go, removing the one remaining spot for leisurely congregation and turning attention away from the open passage into Leavenworth. The image created by the mayor’s proposals turns upside down everything the United Nations stands for, making a mockery of the Universal Declaration of Human Rights inscribed on the plaza floor. If the plaza loses this underlying theme of idealism and becomes simply a site of farmers’ markets and antique fairs, carefully supervised festivals, and transit stops, it will graphically mark the victory of corporatism in San Francisco. The interesting thing about the plan is that — aside from Our Mayor — nobody likes it. So who’s left? A man seeking a monument to his reign. Spring was a little different in Cambridge, Massachusetts this year, as Harvard students occupied the president’s office, seeking a living wage for university janitors and dining hall workers. The three-week presence of these young Davids in Massachusetts Hall received active support from organized labor and national media attention, as well as their Goliath’s acquiescence to their demands. Mark Engler places the event in national and international perspective. After twenty-one days inside the president’s office at Harvard University, living wage activists have emerged victorious. Here’s why their sit-in not only shook the campus, but signaled an important win for progressives across the country who are fighting globalization battles on the home front. All that has changed. On Tuesday, May 8, the activists, having extracted impressive concessions from the administration, exited the building to greet hundreds of cheering allies. Their three-week occupation drew supporters from throughout the Boston community, attracted national media attention to the plight of those exploited by the world’s richest university, and put discussion of economic injustice at the center of campus life. In the end Harvard agreed to a settlement that, while allowing it to avoid total capitulation, substantively yields to the student demands. The university is instituting a moratorium on subcontracting and it will immediately address the issue of health care benefits. Additionally, Harvard has committed itself to expedite contract negotiations with the Hotel and Restaurant Employees (HERE, Local 26) and with the Service Employees International Union (SEIU, Local 254). Harvard is willing to make pay increases for custodians that result from these negotiations retroactive — raises will take effect as if they were granted to coincide with the end of the sit-in. By showcasing the growing push for living wages nationally, the sit-in highlighted an important example of how the forces combating corporate globalization at major trade summits can fuel campaigns to win the same fight at the local level. Indeed, it is the type of coalition that formed around the living wage issue that gives the Harvard protest a wider significance from a social movement perspective. The sit-in demonstrated the vitality of a unique student-labor alliance that has formed in past years. Unions have nurtured connections with student activists as part of their resurgence under the national leadership of AFL-CIO president John Sweeney. Through the Organizing Institute, the AFL-CIO has worked to recruit a new generation of organizers and has enlisted thousands of student activists and young workers in “Union Summer” internships since 1996. UNITE, the garment workers’ union, invested heavily in the fledgling anti-sweatshop crusade, providing institutional support which helped that movement explode to prominence. Labor’s investment has paid off most visibly in a wave of building occupations that have taken place on campuses. Over the past two years, anti-sweatshop campaigns have produced sit-ins at the University of Michigan, the University of Iowa, SUNY-Albany, the University of Wisconsin, Wesleyan, and the University of Kentucky. Last year, a seventeen-day building occupation at Johns Hopkins addressing janitors’ wages foreshadowed the Harvard students’ takeover of Massachusetts Hall. The Harvard living wage campaign was initiated by a student group called the Progressive Student Labor Movement (PSLM), an organization that was a clear product of the labor movement’s outreach. Several of the members that founded the group in 1997, as well as three of the students inside the administrative offices during the sit-in, were Union Summer alumni. While Harvard represents one of the first major battles around this issue that was based on student mobilization, unions have long been at the fore of the rapidly growing living wage movement. A first major victory took place in Baltimore in 1994, where community and labor activists won a wage ordinance mandating higher pay for low-wage workers under public contracts. Since then, over 50 living wage measures have been adopted in cities across the country. Currently, progressive coalitions are fighting for ordinances in 75 additional cities. That’s why during the Harvard sit-in the AFL-CIO sent in top retainers to help broker the deal with the administration, why President John Sweeney stood among the VIPs present at a huge rally last week, and why labor leaders returned to campus to cordially hold the door for protesters leaving Massachusetts Hall. The enthusiasm at the top levels of the labor organization only hints at the tireless investment of local unions in community-based drives. In the case of Harvard, dozens of campus workers spoke at demonstrations and gave testimonials to the press. Members of the Hotel and Restaurant Employees Union (HERE, Local 26) vowed publicly that they would not accept any settlement that included disciplinary censure of the students. Although living wage measures initially targeted local governments, new laws seek to affect a wide range of subcontractors, as well as businesses receiving tax abatements. The student actions at Johns Hopkins and Harvard were unique in expanding the fight to take on individual private employers. Harvard, sitting atop a massive endowment of almost $20 billion, proved a particularly good target: students effectively attracted media by contrasting the university’s privileged mystique with its miserly treatment of low-paid workers. Similar to the way in which globalization protests have sparked unlikely “red-green” alliances between workers and environmentalists, the living wage campaigns have pulled together impressive coalitions on the domestic scene. The Association of Community Organizations for Reform Now (ACORN), the Service Employees International Union (SEIU), and the Coalition for the Homeless led the wage fight in Chicago; hotel workers, Greens, and renters’ rights activists united in Santa Monica; interfaith groups, Gray Panthers, social service providers, and third party advocates have joined elsewhere. Some notable living wage campaigns have started using civil disobedience and mass action tactics to leverage political change. In addition to the university sit-ins, the Chicago campaign mobilized impressive crowds of 15,000 for its marches. And HERE workers were arrested after blocking traffic in actions that were a part of the Santa Monica campaign. The sit-in at Harvard will help to make campuses leading locations for the expansion of the living wage movement. Student-labor alliances have only strengthened after mass demonstrations like Seattle’s, where the two constituencies took to the streets together. The interaction of these groups could not be more significant, especially for globalization activists seeking to ground themselves in local campaigns. In large part, the success of the protests at large trade summits can be measured by the extent to which people who are energized and inspired by the large-scale events commit to combating abuses of corporate power taking place “in their own backyards.” Organizers working to encourage action around such issues as sweatshops, organic farming, welfare reform, prison expansion, and demilitarization are all striving to make the connection between community and international affairs. The living wage is another example of an issue making that connection, and it is a crucial one. Students publicizing the drastic inequalities present on their increasingly corporate campuses go far in asserting that poverty wages are unacceptable — at home or abroad. Universities subcontracting maintenance and security jobs to low-paying firms respond to the same impulse that motivates the Gap to have clothing made in Salvadoran sweatshops. Confronting this injustice, the growing living wage movement forms a vigorous part of the grassroots resistance to globalization’s “race to the bottom,” wherein CEO salaries skyrocket while those at the bottom of the labor market struggle to survive. Taken as a whole, the wage measures that have already been passed represent some of the most tangible progressive gains of the past decade. The campaigns are at once pragmatic — concretely benefiting the working poor — and visionary — suggesting what Left coalitions can accomplish as groups begin to unite and force change. It wasn’t an enlightened epiphany that made university officials see the justice of paying its workers decent wages. It was power. The students’ civil disobedience forced a reconsideration of the living wage issue, and the community’s amazing solidarity made putty of the administration’s once inflexible bargaining position. One thing is sure: the lesson won’t be lost on students at other campuses who, along with community and labor allies, will be looking to turn one successful sit-in into a persistent challenge to economic injustice. Mark Engler is an independent writer and activist from Des Moines, Iowa. He has previously worked with the Arias Foundation for Peace and Human Progress in San Jose, Costa Rica, as well as the Public Intellectuals Program at Florida Atlantic University. For more information, consult the Harvard Living Wage Campaign.